Weather talk seems appropriate right about now. It’s been absolutely nuts in our area with over one foot of snow in the past week, followed by freezing temperatures, no melting only refreezing, and a crazy ice storm. Today we have melting snow, rainstorms, and increasing temperatures in the now lower forties. So, it’s been blissful and nuts all in the same. We have gone for walks everyday but yesterday because of the ice storm. We usually don’t have this much snow stick around for too long and we wanted to enjoy it while it was here. It’s so white, bright, and quiet. The snow makes things so clean looking, blissful, and I would imagine that’s where the Winter wonderland saying comes from, it truly is wondrous. It’s given me plenty of time at home with only a couple of trips, one to the store and one to drop off said groceries for my Mom. It’s been the kind of icing roads if we don’t need to be on the road I’d rather not. So I’ve been home and I made this super comforting and full of vegetables Crispy Sweet Potato and Sautéed Chard Pasta. I love this because it’s first off pasta, a comfort food much of the time. But it has a ton of beautifully nutritious chard and it’s topped with crispy sweet potatoes for a crunch texture that I was craving. 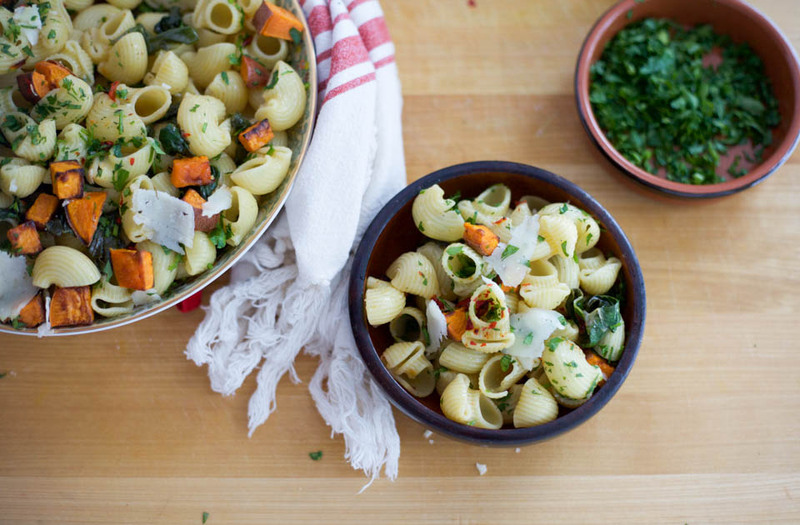 Of course there’s tons of parsley and a little salty Parm cheese appropriate for any pasta dish. A big bowl of this after an evening yoga with Brian and a huge ice storm was pure heaven. I’m certain everyone, even the kiddos, will love this dish. Chard that is lightly sautéed has a lovely flavor with balsamic vinegar that cooks down for a much needed acidity, and that helps with the bitter green flavor. And that’s also how I know kids will like it! Just add a touch extra cheese for them or you and enjoy! Easily add extra greens or sweet potato for more nutrients if you love the vegetables! If you eat meat you can add some chopped chicken or roasted chicken sausages, or eat it as is, it’s delicious! Place oven rack in top third of oven and preheat to 425 degrees. Boil water for pasta according to instructions on package. Toss chopped sweet potatoes with 1 tablespoon olive oil, 1/4 teaspoon salt, and 1/4 teaspoon pepper. Place on oven safe sheet pan lined with parchment paper. Bake for 10 minutes, broil on high for 2-3 minutes to crisp. 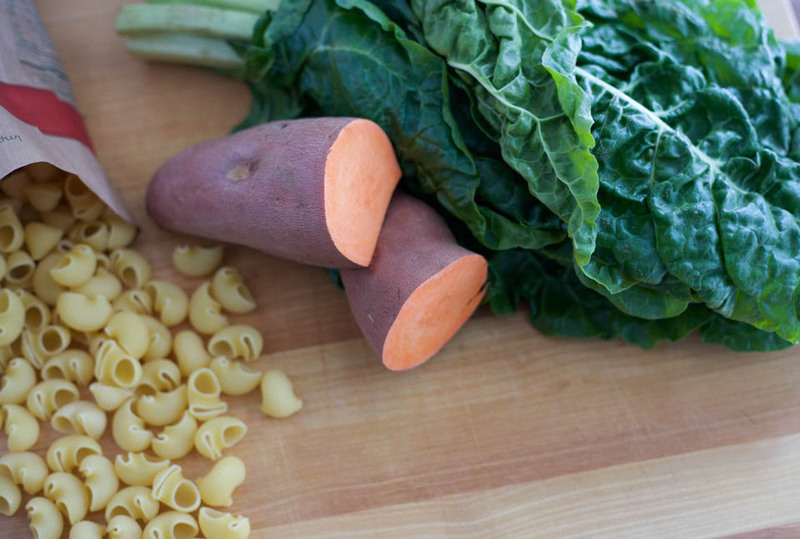 While sweet potatoes bake, work on pasta. Start cooking the pasta in the water now. Heat 2 tablespoons olive oil in a large sauté pan over medium heat. Once oil is shimmering, add garlic and cook for 30 seconds stirring once. 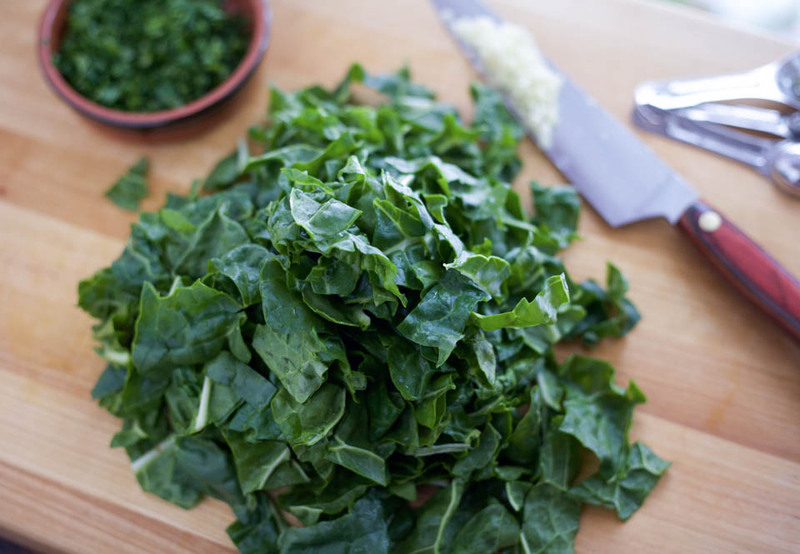 Add chard, toss to combine with oil and garlic, cook for 3 minutes. Add balsamic vinegar, 1/4 teaspoon salt and 1/4 teaspoon pepper. Using a slotted spoon or spider, remove cooked pasta and add to the chard, taking some of the pasta water is ok, it makes the sauce. Drizzle with 1 tablespoon olive oil and add red chili flakes. Place in a large serving dish, toss to combine. Serve immediately with extra red pepper flakes, fresh parsley, and grated Parm cheese. Store leftovers in an airtight container for up to 3 days. 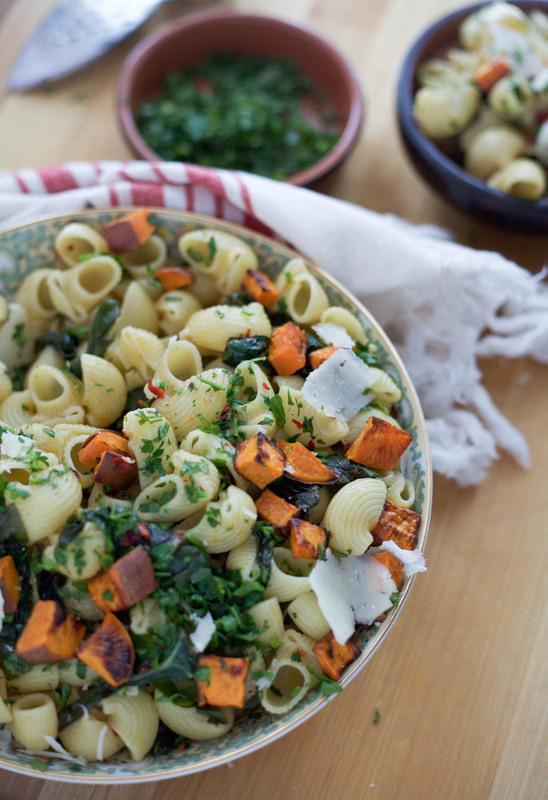 I love sweet potato so much, but I’ve never tried it with pasta before; this looks delicious!! Thank you, me either so I had to try and loved it! I’ve never tried the sweet potato with pasta! Can’t wait to try this one! Cooked this tonight. Used glutton free pasta, added kidney beans for protein for veggie tarian wife. Used sheep Spanish Manchego cheese, finely grated. For myself had broiled lamb round steak, medium. It all tasted great. Thanks for your blog. You are the best! Thank you always for your kind words. I am so happy to know my recipes go to good use :). I love lamb!